Traveling in the off-season always has some trade-offs. In a warmer season, I would have loved to hike the Muggenstutz Dwarf Trail or explore kid-friendly Murren. Which is why I believe traveling begets traveling. Once you start learning about what’s out there, or accidently discovering treasures, you have to keep going. Yet, we were able to fill five days of awesome in Switzerland, and make some minor adjustments to see some of the very best of Switzerland. One example is the day trip via train to Gruyeres and Broc for cheese and chocolate tasting. In warmer weather, you can purchase tickets on the “Chocolate Train,” which is a pre-packaged trip from Montreux to these neighboring villages. While we weren’t able to book the tourist-friendly train, we were able to make all of the same connections independently, at a cheaper price and smaller crowds. Not a great picture, but we had such a great time. And this is what it looked like. It wasn’t hard to get our crowd excited for a day spent eating chocolate and cheese, but when the Belle Époque train arrived into the station shortly before 9:00 a.m., our anticipation only grew. I wish I had taken a picture of this historic train car, straight out of the days of fancy train travel, but it just didn’t happen. 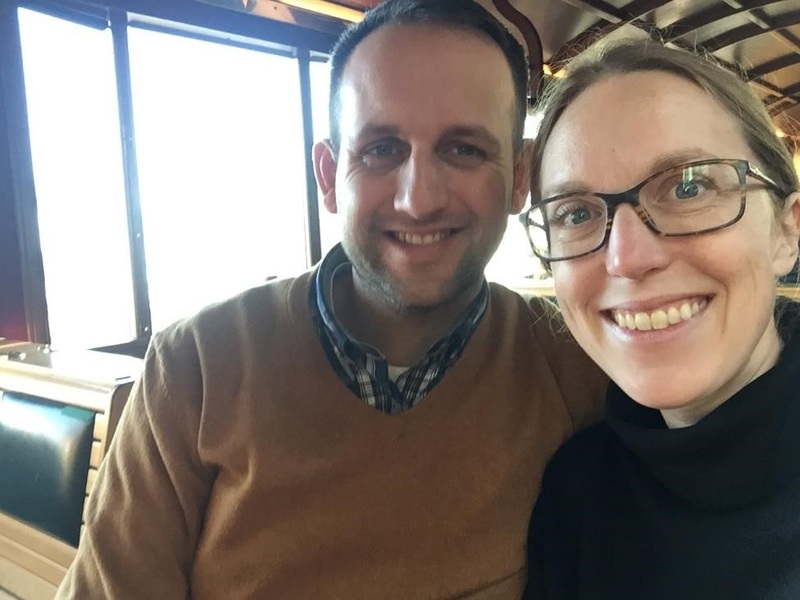 Picture us eating our chocolate croissants under lamp light while we pulled out of the station and started weaving our way up the mountains beyond Montreux. It was special. 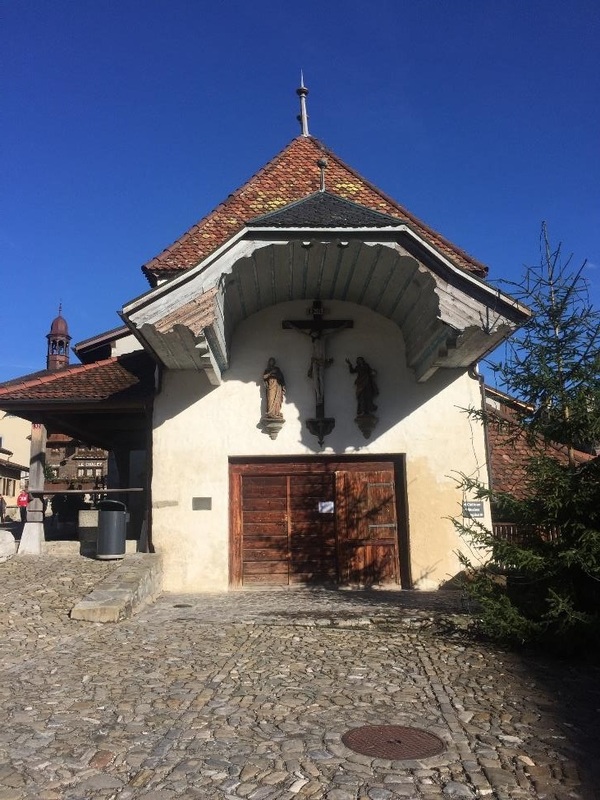 We decided to work our trip backwards so that we wouldn’t feel rushed to explore the town of Gruyeres without feeling like we were going to miss the highlight of the day – the Callier Chocolate Factory in tiny Broc. Now owned by Nestle, this place was amazing. We were able to jump right into an English tour, which started with a theme-park caliber tour through the history of Swiss chocolate. We then were free to wander through the museum where we tasted, touched, and smelled the ingredients of Swiss chocolate. At the very end, we got to taste all of the types of chocolate for sale there at Callier. This was all that Charlotte had been waiting for, and it was almost too much to handle. In fact, I think I skipped the last three varieties. On top of tummies full of sweets, our kids thoroughly enjoyed the small playhouses out front. Cora would have been perfectly content playing in “her home” the full day. Can you see that cute face? After about 1.5 hours in Broc, we took the train back to Gruyeres, where the infamous cheese factory is just outside the train station. We decided to first venture up to the medieval town, to time our visit to the cheese factory when they were actively making cheese. 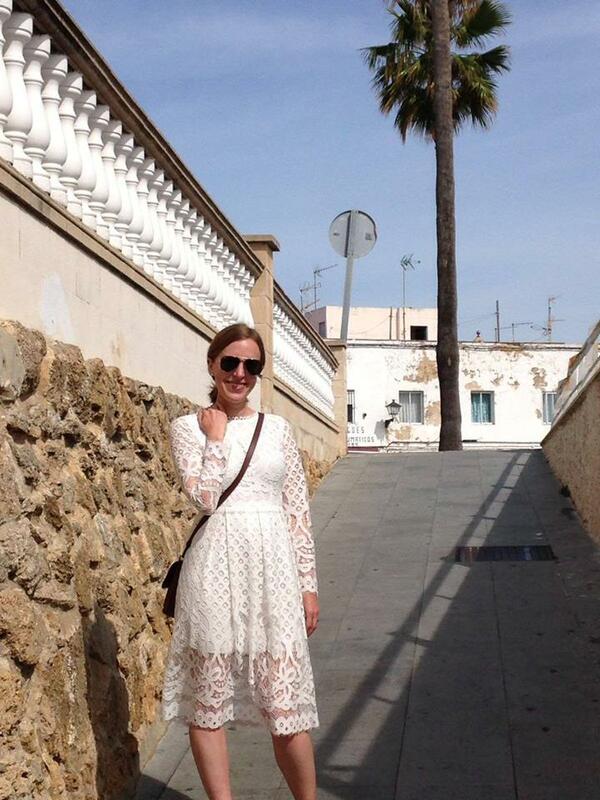 We skipped the available bus, and took the easy walk up the hill to the village. It was a gorgeous day and a gorgeous walk, and easily another highlight of our trip. Which, again, is why I’d love to do one of these Dwarf trails or the like. What my Swiss dreams were made of. They are not ready for a traditional Grand Tour, but we’ve enjoyed doing it somewhat piecemeal. 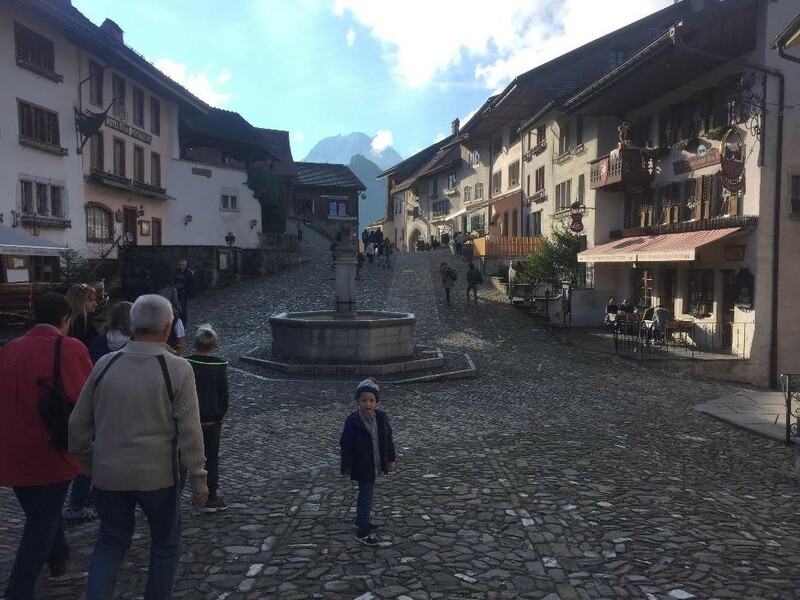 Anyhow, such a cute village, even if it is highly touristy and full of shops and price inflated fondue restaurants. We walked up to the castle, but had read enough comments to pass on entrance, so we just enjoyed the views. The restaurants I had researched in advance were already full, so we took the first table that was offered to us. The fondue filled us up, even if the ambiance wasn’t anything special. And I discovered that I like the taste of tangy pickles smothered in rich hot cheese. I love these details of town life of days gone by. We then walked back down to the cheese factory, only to discover that they were done making cheese for the day. But, we enjoyed the short tour through the facility, where we saw all of the equipment and videos of it all in action. 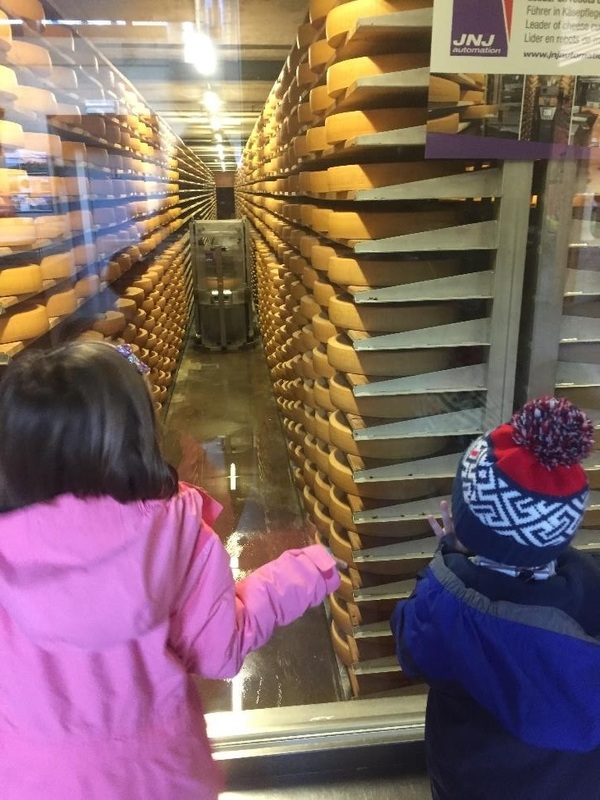 There were also some interactive opportunities, like smelling all of the different plants that the cows eat while summering in the Alps, ultimately enhancing this fancy cheese. 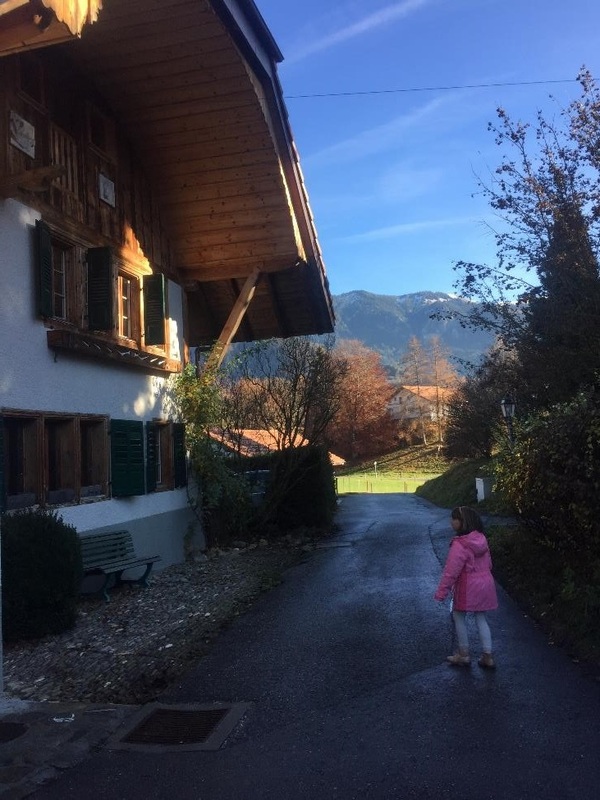 As part of our entrance ticket and tour, included in the Swiss Travel Pass, we each received a tasting package of Gruyere cheese, aged three, six, and nine months. We took our cheeses for an on board snack on the ride back to Montreux, only to watch the hourly train depart the station. So, we headed back to the cheese factory to play with children from Spain, Switzerland, and Canada to pass the time. Once again, we found a solid playground with beautiful scenery and lots of languages to be a comfortable way to wait, and this time we were also rewarded with a bit of a sunset. Finally, our train arrived, and we tore into our cheeses and a box of Gruyeres’ famous double meringues. A perfect ending to a fantastic day.